In the range of 2 component fluids there is an unlimited area of products and applications. To ensure a homogeneous mixing of the products the application needs a special mixer size, type or the number of mixer and spirals. 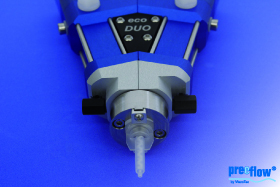 Now there is a best practice accessories for dosing with the eco-DUO450 which allows the adaption of a commercial bayonet mixer. The range of potential applications extends a lot. We answer and deal with your enquiry with pleasure.